Markus Maskuniitty began his music studies in the Rauma Youth Band at the age of 9 and went on to study with Timo Ronkainen at the Helsinki Conservatory and the Sibelius Academy. His other influential teachers were Olavi Vikman, Antero Kasper and Radovan Vlatkovic. Maskuniitty was a prizewinner at the Nordic Horn competition in 1989, at the Markneukirchen International Instrumental Competition in 1991 and at the ARD Competition in Germany in 1994, and he was named Brass Player of the Year in Finland in 1992. He has created an extensive career as a horn soloist in the capital cities of three European countries. Maskuniitty joined the Gustav Mahler Jugendorchester as Principal Horn in 1990. On tour with the orchestra, Claudio Abbado was impressed by Maskuniitty’s playing and invited him to audition for the Berlin Philharmonic. 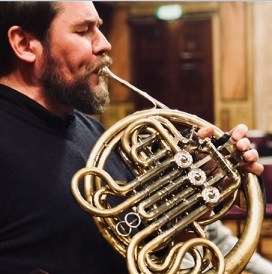 He played Principal Horn with the Finnish Radio Symphony Orchestra from 1991 to 1993 and then joined the Deutsches Symphonie-Orchester Berlin as Principal Horn. Eventually, in 1997, he joined the Berlin Philharmonic as Principal Horn. In 1999, he left this position to return to the Deutsches Symphonie-Orchester, where he remained until 2007. In 2000, he also played with the Bayreuth Festival Orchestra. Maskuniitty joined the Royal Stockholm Philharmonic Orchestra as Principal Horn in 2007. He has also been a member of the Stockholm Chamber Brass (2000–2010) and the Berlin Philharmonic Octet. Maskuniitty has premiered horn concertos by Jukka Linkola, Harri Wessman and Jorge Torres Sáenz and a double horn concerto by Andrea Tarrodi. He was appointed Professor of Horn at the Hannover Musikhochschule in 2000. The horn concertos album on Ondine is Markus Maskuniitty’s solo debut recording. His previous recordings include chamber music with the Stockholm Chamber Brass (BIS), as well as the premiere recording of Penderecki’s Sextet (Naxos). In addition, Maskuniitty’s solo horn playing may be heard on several recordings made by the Finnish Radio Symphony Orchestra, the Deutsches Symphonie-Orchester, the Berlin Philharmonic and the Royal Stockholm Philharmonic Orchestra, including the 1998 live recording of Bruckner’s Fourth Symphony with the Berlin Philharmonic under Günter Wand.